Just when we thought a wonder drug for weight loss would never surface, out came Orlistat, the first of the prescription appetite suppressants (also available over the counter as Alli). An interesting compound, orlistat works by preventing the body from absorbing some of the fat that it takes in. However, this does not mean you can sit and eat nachos covered in hot dogs topped with butter all day, because orlistat side effects can be pretty nasty if you don’t monitor your fat intake, and can include oily stains in the underwear, frequent flatulence and urgent bowel movements. The main difference in the xenical vs. alli battle is that one you can buy at a drugstore and one you must have a prescription for. Internally, the ingredients are pretty much the same. Both products contain orlistat which slugs up the enzyme that breaks down fat, sending a good portion of it to the porcelain gods. When comparing xenical vs. alli, you will first notice that the Xenical orlistat content is 120 mg. compared to Alli’s 60 mg. Both medications are taken with meals. One of the benefits lending a hand to the pro-xenical argument is that you are required to see a doctor to obtain it. This means that when looking at xenical vs. alli, one gives you a doctor to work with and see regularly to be on the lookout for potentially hazardous side effects such as liver damage. With Alli, you’re on your own. So does the difference in ingredients mean that the xenical vs. alli debate is case closed? Not really. Both are effective at reducing fat absorption. 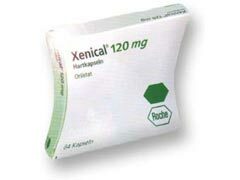 Xenical prevents absorption of up to 33% of fat from foods. Well then does alli work? Sure, it blocks up to a quarter of your fat from being absorbed. The differences here are simply due to the amount of active ingredient in each medication. If you can deal with the sometimes unpleasant side effects that come from orlistat, it can be a great addition to a healthy diet and exercise routine. However, don’t be the person that thinks they can eat whatever they want while on this medication, your underwear will thank you later.